In the 6th century AD, St. Brendan, an Irish cleric, and eighteen other monks, sailed out from Ireland to cross the ocean. Amidst their journey, they came upon a black, treeless island and decided to make camp for the night. Several monks set up a cooking station and lit a fire. And then the island began to move. Terrified, the monks fled back to their boat, leaving the food and fire behind. St. Brandon urged them not to be afraid; it was simply the great fish Jasconius, “which laboreth night and day to put his tail in his mouth, but for greatness he may not” (Navigatio sancti Brendan abbatis, 9th century, translated from Latin). 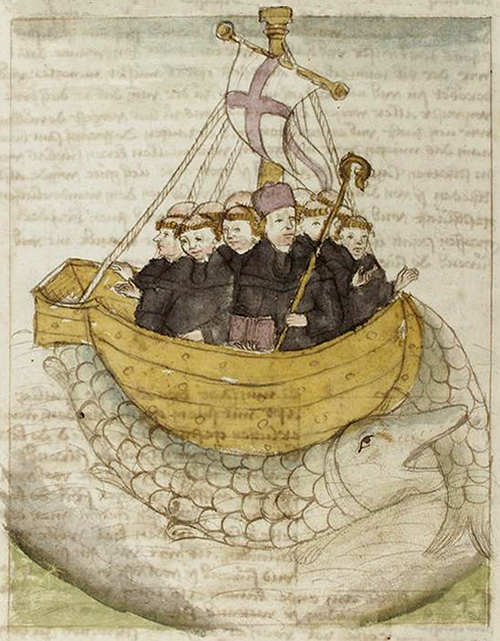 St. Brendan atop Jasconius. Manuscriptum translationis germanicae (ca. 1460, Cod. Pal. Germ. 60, fol. 179v, Universitätsbibliothek Heidelberg). http://www.hs-augsburg.de/~harsch/Chronologia/Lspost10/Brendanus/bre_navi.jpg. Gessner describes Jasconius by another name: the Trol whale or Devil Whale, which lies asleep in the water and is often mistaken for an island by hapless sailors. Gessner was likely inspired by Magnus, who claims that the whale’s skin is like sand, lending to its confusion with a beach. When the whale is disturbed by the sailors’ dinner fires, it sinks, causing such a whirpool that the ships themselves are often sunk. The Devil Whale, complete with sailors trying to cook a meal on its back. Gessner, Conrad. Historia Animalium. 2nd Ed. 1604. http://biodiversitylibrary.org/page/42165750. For centuries, men have imagined all manner of aquatic monsters. The ocean was a strange and foreign place, and even several hundred years ago, was very little explored. “If the very body of the ocean presented a fearsome aspect, with its dark, roiling waters, its threatening visage, and its intimidating vistas, its occupants were the quintessence of terror,” wrote marine biologist Richard Ellis in his book Monsters of the Sea. “The landlubbers’ only contact with the large creatures of the sea was at best sporadic and often completely incomprehensible” (Ellis, pgs. 193-194). This sporadic contact spawned tales of horrible beasts. Quite often, these horrible beasts were, in truth, cetaceans. Even before sailors encountered whales in the ocean, washed up carcasses, sometimes badly mutilated, ignited a fear of the creatures of the deep. According to Ellis, “the sperm whale, with its mysterious habit of stranding on shallow beaches, was probably responsible for many of the legends and myths of sea monsters.” (pg. 194). The record of sperm whale strandings is quite dramatic. Quite often, they are stranded en masse. For instance, in 1723, seventeen whales were stranded ashore the Elbe River in Germany. In 1784, thirty-one made landfall in Brittany. In 1888, sixteen washed up in Cape Canaveral, and in 1974, 72 were found on the coasts of New Zealand. A variety of circumstances can result in a stranding, including rough weather, illness or age, difficulty giving birth, hunting mishaps, or even attempts to rescue another whale in distress. Sperm Whale stranding. Jonstonus, Joannes. Historiae naturalis de quadrupetibus libri. pt. 2-6. 1650. http://biodiversitylibrary.org/page/44040300. The sperm whale (Physeter macrocephalus) is a strange animal, even among whales. The largest toothed whale, and toothed predator, in the world, the sperm whale holds many records. It has the longest intestinal tract and largest brain in the animal kingdom. It also has the largest nose of any animal and cavities within its head hold reservoirs of liquid wax called Spermaceti. This behemoth can reach up to 67 feet long and weigh as much as 125,000 pounds! A Sperm Whale in search of food. Scammon, C.M. The marine mammals of the north-western coast of North America. 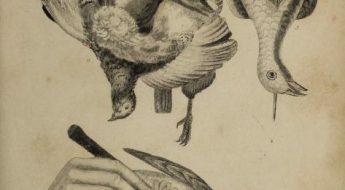 1874. http://biodiversitylibrary.org/page/16226208. While their strange appearance and prolific beachings likely inspired many monster stories, sperm whales are not the only cetaceans that natural history writers had contact with. For instance, a blue whale – the largest animal to have ever lived – is documented as having come ashore as early as 1692, in Scotland. A 95-foot specimen was placed on exhibit in Europe in 1827, “further enhancing the image of the whale as a gigantic monster” (Ellis, pg. 197). Interactions with right whales, bowheads, baleens, and orcas also inspired Leviathan legends. The range of monsters inspired by cetaceans is charmingly diverse, including many varieties in addition to the Devil Whale. 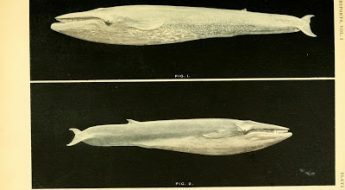 Most are likely the result of an amalgamation of many species, and some (like the Devil Whale) may also have been shaped by religious undercurrents. Physeter, or Prister. Magnus, Olaus. Historiae de gentibus septentrionalibus. 1555. http://biodiversitylibrary.org/page/41862918. Prister attacking a ship. Magnus, Olaus. Historiae de gentibus septentrionalibus. 1555. http://biodiversitylibrary.org/page/41862919. How can such a beast be defeated? Not by cannon-fire. Magnus warns that the beast’s layer of fat is too thick for such absurdities. Instead, try sounding a trumpet, which will startle the monster, or dump some empty barrels in the ocean, with which the creature will become distracted and stop to play. The Prister, monsters actually identified as whales in historic publications, are reported to be mighty enough to sink the strongest ships. Cannon-fire was, according to Olaus Magnus, who published three versions of them in 1555, useless against these beasts. Instead, sailors should sound trumpets and throw barrels into the water to distract these monsters. See more fantastic historic monsters come to life on the Smithsonian Libraries’ Tumblr. GIF created by Richard Naples (Smithsonian Libraries), based on Gessner, Conrad. Historia Animalium. 2nd ed. 1604. http://biodiversitylibrary.org/page/42165750. What species is this monster likely based on? Well, Baleen Whales do actually have two blowholes, and Magnus refers to the beasts as Physeter. The modern-day suberfamily including sperm whales is Physeteroidea. The Ziphius, after Magnus. Gessner, Conrad. Historia Animalium. 2nd Ed. 1604. http://biodiversitylibrary.org/page/42165841. Thus Magnus describes the Ziphius (translation via John Ashton’s Curious Creatures in Zoology (1890)), whose name comes from the Greek xiphias, meaning sword (recall Magnus’ comparison of its fin to a sword). 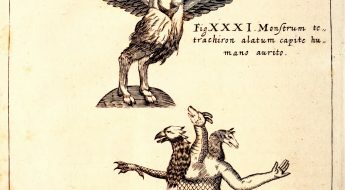 This bizarre, owl-headed creature is depicted with a seal in its jaws. This, and the shape of the fin, suggest that the monster may be based on an Orca. A Great White Shark has also been suggested. We all know whales are real, and we know that they can grow to extraordinary sizes (the largest size on earth, in fact). They have even been documented to attack and sink ships (for instance, in 1820, the vessel Essex was sunk by a sperm whale), so those crews wishing to harpoon a whale has reason to be cautious. Physeter, or Prister. Magnus, Olaus. Historiae de gentibus septentrionalibus. 1555. http://biodiversitylibrary.org/page/41862920. Does the Leviathan exist? Yes. Even within the sixteenth century writings of Magnus and Gessner, Leviathan monsters such as Devil Whales and Pristers are identified as whales. However, are you likely to mistake a whale for an island and try to cook your dinner on it? Is a whale prone to kill a human simply for the fun of it? Probably not. As is the case with all monsters inspired by real animals, limited – and sometimes dramatic (think witnessing a breaching near your boat for the first time, or stumbling upon the decomposing corpse of a sperm whale) – contact with these mammals fueled fear and sensationalism, resulting in harrowing tales of great beasts roaming the oceans. But, in the end, a Leviathan, by any other name, is simply a whale (or perhaps an Orca) and most definitely not a monster. Browse historic illustrations of leviathans and their whale counterparts on Flickr. Carve a Leviathan in your Halloween Pumpkin this year! Share your carvings with us on Facebook and Twitter! Simon, Matt. “Kraken and Owl Whales: Take a Dip with History’s Most Terrifying Sea Monsters.” Wired. 13.09.13. Web. 20.10.14. http://www.wired.com/2013/09/carta-marina/#slideid-591797.